Bitcoin Mining. Is it Worth it? At long last... THIS is actually the game that got me started with app development. Here is the story... Almost 2 years ago now, I saw that silly little game with the bird and the pipes. The first thing that hit me was, "Wait... I wrote that f'n game model 20 years ago! How the hell is this guy making $15k a day with this silly, badly made rendition of an old model?!" Well, that's the way it goes with the internet lottery. You never know what's going to be a hit. So it's not like I can really fault anyone for their good fortune. But it got me thinking... If only I had some clue how to develop apps for Android, maybe I could develop games. And this was a grand idea. Because many years ago, at a previous time in my career, I actually did do game development. Macromedia Director was the weapon of choice. And I developed a boatload of games of various types from Pac-Man to Asteroids to Tetris. How hard could it be to translate what I knew then to today's stuff? Well, it's not as simple as that. Nothing worth doing ever is. Anyway, I got to work. I got the Android SDK. I got Eclipse. I learned how Java works. I did the tutorials. As of now, I have 13 apps up and running on Google Play (and Amazon). So I accomplished what I had set out to do. Well, not completely. In order to REALLY do what I'd set out to, I had to create a new version of the game model that got me started. And this game is it. So here you have it. 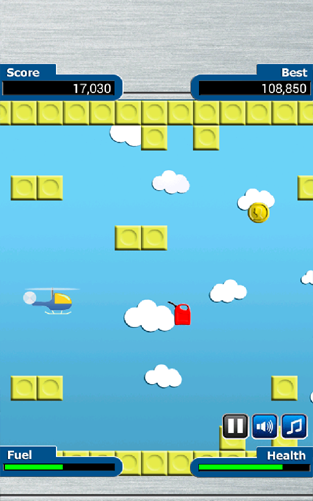 A simple sidescroller with a helicopter that you control by tapping/holding the screen. Fly through obstacles and get points. Try not to crash. Enjoy! This is by far the most ambitious project I've ever done for Android. And after all the effort I put into it, it's still not quite perfect. There is a bit of a lagging issue on some devices. It's not a game breaker, as it were. It still functions fine. It's just not so smooth. Hopefully, I will get that worked out in an upcoming version. Local version. Follow instructions on previous page. All content Copyright © 2002-2019, DPoisn, LLC. All rights reserved. All logos, unless otherwise noted are trademarks or registered trademarks of their respective companies.